New Delhi, 19 June 2017: The Ministry of Rural Development organized an Award function on 19th June, 2017. The Programme showcased achievements under different programmes implemented by the Ministry of Rural Development. States, Institutions and Government Functionaries, who have done commendable work under different schemes were awarded in the function. Short films on Water Conservation under Geo-MGNREGA, Construction of houses under Pradhan Mantri Aawaas Yojana of Jadia Bai, a 100 year old tribal women of Madhya Pradesh and an audio visual song on PMGSY which was sung by Shan were also shown. A Citizen centric mobile application on MGNREGA capable of providing information on different aspects of GNREGA Programme was launched by the Minister for Rural Development. The Department of Rural Development extensively uses Information and Space Technology in its programme management and the “Jan-MGNREGA” App is a third such citizen centric initiative of the department after “Meri Sadak” and “Aawas” mobile app. Total of 144 Awards were given under different programmes. Awards on Sustainable Livelihood, Transparency and Accountability, Aadhaar Seeding, Conversion and Geo-MGNREGA were given under MGNREGA. Under Pradhan Mantri Gram Sadak Yojana, awards were given to States for highest amount of rural roads (Bihar) and use of Non conventional construction material (Madhya Pradesh). Haryana, Gujarat and Karnataka received a special prize for completing more than 95 percent of PMGSY (Phase I &II) targets. Under PMAY-G Awards were given to States which performed well on different parameters, Central Building Research Institute, Roorkee which provided technical vetting of housing typologies, NIC team of the Department of Rural Development for technical support and Dr. Prabir Kumar Das, Senior citizen, Advisor, UNDP for significant contribution in use of innovative technologies. 9 District Collectors who have completed largest number of PMAY-G houses were also awarded, the significant part being 5 of the 9 District Collectors coming from Odisha. Awards were given to National Resource Organizations, State Rural Livelihood Missions and Punjab National Bank, State Bank of India, Allahabad Bank, Indian Overseas Bank, UCO Bank, Central Bank of India and ICICI Bank. The States which received awards were Andhra Pradesh, Telangana, Kerala, Chhatisgarh, Jharkhand, Odisha, Madhya Pradesh, Rajasthan, Bihar, Karnataka and West Bengal under different categories. Under skill development category the best performing States, best champion employers and best training partners, received the awards. There was also a presentation on the key findings of evaluation of National Rural Livelihood Mission carried out by Indian Institute of Rural Management, Anand. Evaluation report had highlighted the main strength of the programme and has given many suggestions for strengthening and expansion of the programme across the country. The Minister of State for Rural Development, Shri Ram Kripal Yadav, complimented the award winners and highlighted the role of institutional partnerships in successful implementation of rural development programmes. The Minister for Rural Development, Shri Narendra Singh Tomar congratulated the award winners. He highlighted the major transformation that was brought by the Government in programme execution. He indicated that the Government has completed restructure MGNREGA. The investments are channelized for Water harvesting, Water Conservation and Agricultural and Allied activities to strengthen resource base of the rural poor. Targets under PMAY–G and PMGSY have been set for 2019 and the Government is fully committed to provide financial support to the States to achieve these targets. He also highlighted the use of Information Technology and Space Technology in programme monitoring and in obtaining citizens feedback through mobile applications. Shri Tomar, mentioned employment generation under different programmes of the department, especially the skilling of rural youth and skilled employment opportunities being created for them. He also highlighted challenges that people faced in rural areas and exhorted the State Governments, Officials and other Stake Holders to work together to overcome these challenges and provide a better deal to people. 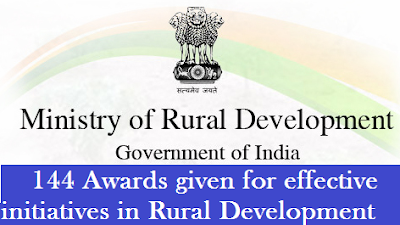 Ministry of Rural Development -144 Awards given for effective initiatives in Rural Development. Total of 144 Awards were given under different programmes. Awards on Sustainable Livelihood, Transparency and Accountability, Aadhaar Seeding, Conversion and Geo-MGNREGA were given under MGNREGA.